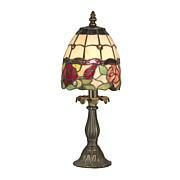 Pretty as a picture, this Paula Tiffany Table Lamp will easily enliven any decor in your home or office. 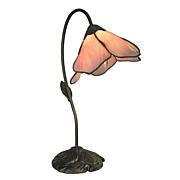 The lovely art glass shade features a multicolored blue background with a bevy of colorful pink and purple flowers. The floral pattern is nestled amongst lush greenery that is accented throughout with art glass gems for added texture and sparkle. A pretty choice on end tables, nightstands or a console, it's a must-have piece for any Tiffany enthusiast that will easily accentuate any decor style in your lovely home or office. Sent this lamp back. 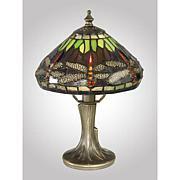 The lamp had defective glass. There were bubbles on the surface that had broken open. This left hole in the glass.the lamp had been properly soldered but poor workmanship. 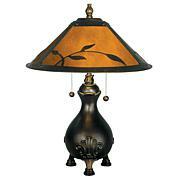 Lamp & shade does not sit straight and too expensive to try to bend. Rubber instead of lead around the individual glass pieces, and applied very poorly.